Fiction dealing with natural disasters and their aftermath isn’t something that’s rare, though it’s not as common as, say, zombies. So when I read books like this one, the uniqueness often comes from the characters and the way they deal with the situations they find themselves in. I also particularly liked Erika’s relationship with Star. There’s something particularly sweet about people choosing to adopt children who have been orphaned in a situation like that, since a lot of people would only look out for themselves. I did feel that the author did a good job of showing the different attitudes of people after what had happened. I did have some confusion with various characters who merged together at times, but I felt the danger they faced came across as real and I truly cared about what happened to them – though, at first, it did seem as if Erika was more concerned about her husband’s safety than her son’s. I would probably read the next books in this series at some point, as well as check out other books by this author. 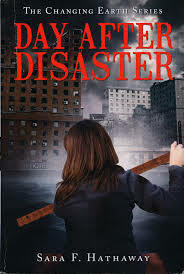 Thank-you so much for your candid review of Day After Disaster. I am glad you enjoyed the story. When I wrote this novel it was simply because I had a story in my head. It was a refection of what might happen in a given scenario. I never intended to publish but I am so glad I did. It has been a treat to share the story with the world and hear all the interesting feedback! I am about half way through the next book now, which catapults readers into a world struggling to survive the aftermath and adapt to the continued alterations of the changing earth.